The urgency of the problem of smartphone integration in cars has only been made worse by in-vehicle connectivity systems pushed by Apple (CarPlay) and Alphabet (Android Auto), which further encourage the use of smartphones in cars — but not always in a safe distraction-free scenario. Wireless carriers, as well, have been threatened with litigation by safety advocates for failing to do enough to mitigate distracted driving. The latest step in this evolution is the emergence of technology and systems for communicating the signal phase and timing of traffic lights to drivers involved in active phone calls when their cars approach intersections at a predetermined distance. 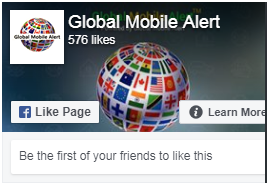 Global Mobile Alert is uniquely qualified to help solve the problem of distracted driving. It owns the technology for wirelessly communicating the signal phase and timing (SPAT) of traffic lights to drivers when they are on an active mobile phone call. This technology sets Global Mobile Alert apart by not only combatting driver distraction, but also introducing a heightened degree of situational awareness and collision avoidance. 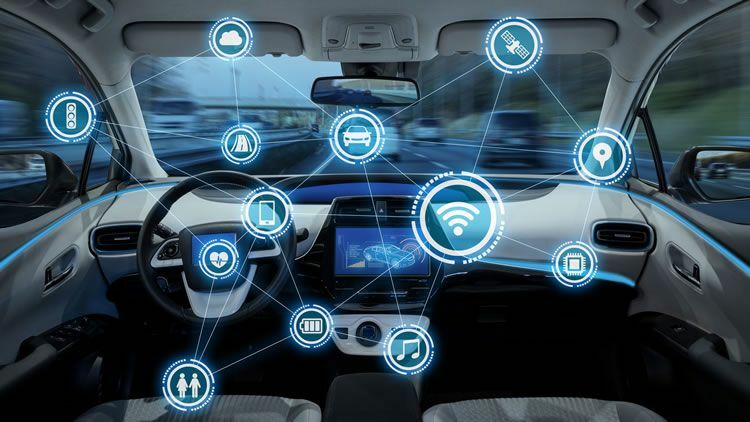 At the same time, intelligent transportation companies are working toward the automation of a much larger proportion of intersections in the U.S. and around the world. With one-third of all highway fatalities occurring at intersections, and with increased demand to optimize traffic management, the focus on vehicle-to-infrastructure communications is increasing rapidly. 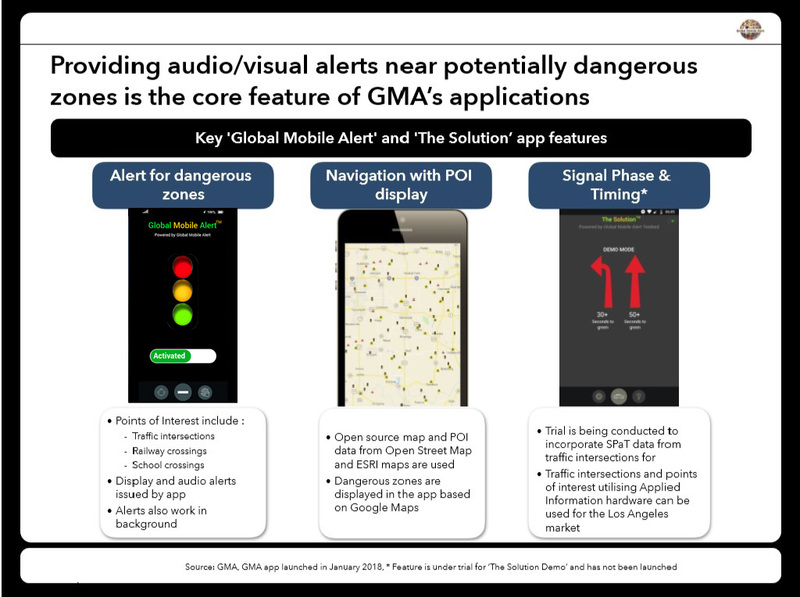 Global Mobile Alert is in position to take advantage of these advances, which will integrate wireless intersection status (SPAT) communications with in-vehicle systems. Companies including Cubic Transportation Services, Transcore, Iteris, and others are targeting these capabilities in cooperation with state and Federal traffic authorities. Global Mobile Alert’s technology communicates wirelessly with traffic, school, and emergency signaling systems, allowing mobile devices and vehicle navigation systems to alert drivers of changing conditions and potential hazards – before an accident occurs. This technology is a core building block of today’s fast-growing vehicle-to-everything, or V2X market. Global Mobile Alert offers two solutions: the Global Mobile Alert app for Android and Apple mobile devices, and The Solution for partners developing vehicle-to-vehicle, vehicle-to-infrastructure, and Smart City offerings . The Global Mobile Alert app is available for mobile devices from Google Play or the Apple App Store. It provides a detailed analysis of the mapping of all traffic lights throughout the US and over 50 countries worldwide, effectively using the mapped locations as sensors. Drivers can enable a proactive alert that uses a voice warning to alert them of potential hazards and changing traffic conditions, even while they are engaged in an active voice call. The Solution™ app can interface with navigation systems and give the driver a five-second warning of an upcoming traffic light, school zone, and/or rail crossings where data is available. The app then issues an audible alert alarm to warn drivers that the vehicle is in proximity to the point of interest (traffic light, school zone, and/or railroad crossing). Upcoming signal phase and timing (SPaT) capabilities will enable communication with signaling systems for additional automated status information for activating alerts.